Well I did it. Kind of. 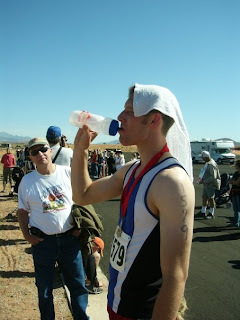 About 5 months ago I committed to enter the St. George Triathlon. Brandon, my brother, and his wife, Michelle, had made plans to do the race, but Michelle got pregnant, so I took her place. I've always been a pretty consistent runner - nothing special, but I like to feel like I'm in shape. I felt like a triathlon would definitely be difficult, but a feat worth accomplishing. We woke up this morning around 5:45 and arrived at the race location around 7. We racked our bikes and laid everything out so the transitions would be quick and effortless. Unfortunately, and fortunately, the 800-meter swim was cancelled due to the windy conditions. So, to compensate for the swim, the race directors added another 5K on top of the 5K we were already supposed to run. The first 5K wasn't so bad. I could've run faster but I knew I had to save some energy. The big surprise, though, was that the entire run was on red sand. Running on sand is much harder than running on pavement, so it took some serious concentration to get through it. We had rented road bikes in Cedar City, so I felt confident going into the bike. It was so frustrating, however, when I would be pedaling as hard as I could when a 15 yr. old boy would casually fly by. The worst part of the entire race was a hill - a mile long, steep hill in middle of the desert. I had dropped my waterbottle within the first mile of the biking, so I was dehydrated and hot. I finished the bike and it was onto the red sand again for the last 3+ miles. Hardest.run.ever. I don't know how I finished. Everyone else must've felt the same because even in my condition I still passed a few people. I crossed the finish line pretty exhausted, but feeling great that I had done something new and difficult. It's been a fun little trip to Southern Utah. I'm thankful for those who came down to support us in the desert sand. Wish you could've been there!